How can the big bang theory and other scientific concepts be used to illustrate principles of Tai-chi? Both science and Tai-chi principles can be difficult to grasp but if they are compared, then both become clearer. In this example I use the big bang theory to explain an advanced aspect of Tai-chi training. The scientific theory of the origin of the universe begins with nothing – no space, matter, energy or time. The universe exists as a “singularity” and then explodes, creating space, matter, energy, and time. As it progresses, the individual stars, planets and other heavenly bodies evolve. The question is, will the universe keep expanding until its energy gives out and then die out? Will it expand to a certain size and then shrink back to a singularity? Will it reach a steady state? These questions are worked out mathematically and I don’t attempt to out-think the physicists and astrophysicists but just use their attempts to understand the universe to clarify our attempts to understand Tai-chi. One of the most difficult aspects of Tai-chi is that you have to become aware of every joint and muscle of the body and how each operates at every second of your movements. This requires a type of attention that is everywhere at the same time. Yet our attention is fixed and located in a specific place (the head). It doesn’t have to be so, yet our culture created this condensation of attention in the head. In my studies of animal behavior (I was an ethologist), and work with thousands of animals in the field and in captivity, I have found that their attention is more evenly distributed throughout their bodies. Human athletes also have this quality of attention. For a student to be able to function with precision and grace, he has to go through a process in which the attention is allowed to individuate (to be located in each joint and muscle of the body). The head cannot direct this attention by the thinking process, because thinking is slow and awkward. In order to have the attention individuate (seep into every part of the body and function there), the fixed point of the attention in the head (the singularity of attention) has to empty. Every increase in individuation of attention requires an equal emptying of the singularity of attention in the head. If we look at the big bang theory, this would mean that as the universe individuates, the singularity must continue to empty. So the singularity doesn’t cease to exist, rather, it is in a balanced relationship with individuation so that its emptying is equal to the evolution of the universe. The existence of the universe doesn’t end the singularity but is one side of the whole while the emptiness is the other side. 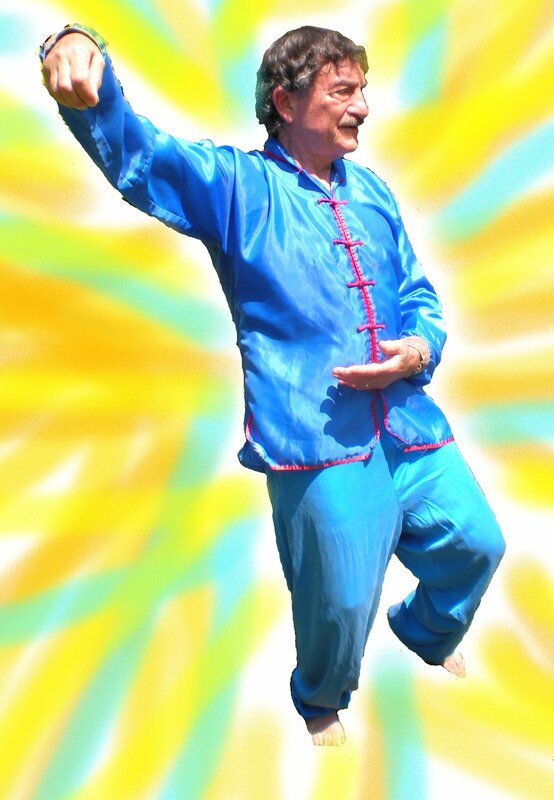 Again, I am not trying to be a physicist but just trying to illustrate a Tai-chi principle. So what is this concept of “emptying”? In Tai-chi it is relaxing, letting go and not fixating on anything. Our attention is usually so weak that it can easily be grabbed by our senses, thoughts and emotions. Most of us are at the mercy of these sensations and have no independent existence. Any form of meditation helps to develop the “passive observer”, a state in which the attention is vibrant but cannot be grabbed. If your attention is not in this state then it is very hard to concentrate on many things at once. The very idea of “you” concentrating on something else means that you are in a state of fixed attention in the head or in the thinking process. If attention is more individuated the individual parts of the body have more say over how you do your form or your push hands and it becomes more creative and spontaneous. The attention in the head and thinking process does not have to end in order to allow the body to be filled with attention, but rather it has to “empty”. It has to move toward the “passive observer” state, which we call “Yin”. Yin is not the absence of “Yang” but the balancing of “Yang”. Yin attention is not “held” and can seep into every part of the body and function there. It can seep into your surroundings as well. When it seeps into a natural area, in which randomness predominates, the attention can easily stay Yin. When it seeps into our modern world, with its geometric, fixed structures, the Yin attention turns Yang. We order the world around us to maintain a fixed Yang attention, which is why it is so hard for us to flow in a Tai-chi form or to relax in everyday life. If we then use these ideas in Tai-chi to understand the big bang theory, then we have to look for a process of “emptying the singularity”, which again does not lead to an end state of but is a continuing process that balances the evolution of the universe. This is a very difficult achievement for Tai-chi students – to realize that letting go is not a goal with an end but is a continuous process. It is the letting go that initiates the movement. Tensing does not initiate a movement. One of my students realized that he keeps putting breaks into his letting go. He lets go a little and then stops because he feels he has “achieved” the letting go. In astrophysics there is an increasing understanding of how “black holes” help in the evolution of the universe. These holes are really matter that is so dense and has so much gravity that nothing can escape them, not even light. It is like attention that is so settled into the body that it cannot be disturbed and grabbed. When a person is comfortable within their own bodies and relaxed, this draws other people to them, just as a black hole pulls matter into itself. The real question for Tai-chi students is, once this individuation is achieved and each part of the body becomes conscious and functional, then where does the intention come from to do anything? If all the attention is dispersed into each cell, organ, muscle and bone of the body and there is only a “passive observer” at the “helm”, then how can things get done? In Tai-chi theory, it is the balance of the individuation and the passive observer that allows creativity to flow. That creativity is the cooperative conscious activity of every part of you combined with the flow of consciousness through you. The “flow of consciousness through you” requires further explanation. In ancient cultures consciousness was not considered to be just the activity of nerve cells in the brain. That is a modern idea. Consciousness was considered to be a natural energy, just as as gravity or what we now know of as electro-magnetic force and subatomic forces are natural forces. Each creature lives within these forces and adapts to them. We have joints and muscles to provide leverage to counteract the force of gravity. In the same way, our brains use the flow of consciousness to function. Since this is the understanding of the culture that Tai-chi evolved from, we have to take this into consideration in our training in order to make sense of it. The state of balance between Yin attention (release) and Yang attention (holding) is the proper state to achieve creativity, not to mention health. But to be willing to “empty” the condensed state of attention in the head is the most difficult task of the Tai-chi student. (This is a technical aside for those familiar with these ideas. If you are not involved in the technical aspects of Tai-chi, please skip this paragraph). Yin is often used to denote “condensing” while Yang is used to denote “expanding”. In this case I am using Yin to mean release and Yang to hold. Yang attention is likened to grabbing a bird to see it. While you can see it, the bird is frightened and unmoving and all you can see is its external appearance. Yin attention is when you release the bird. You can see it until it disappears in the trees but what you are seeing is its true behavior, not just its appearance. When Yin is released, it is said to turn into True Yang or expansion. When that True Yang connects, such as the attention connecting to other parts of the body, the connecting is called True Yin. You can also see that holding or Yang (such as holding attention in the head) results in Yin (condensing). This interaction of Yin and Yang where one generates the other shows their interdependence, but you do not need to know this to understand this blog post; I’m just injecting it here for technical clarity. Now back to the blog post. The teacher has to use his or her teaching creativity to guide the students to that state. The feeling of this type of letting go (of the singularity in the head) has often been compared to jumping off a cliff. If the teacher has helped to develop the body consciousness (“Body-Mind”), you will have something soft to fall on when you jump off that cliff. You will find that the cliff is only two inches tall. This brings me to an important point. In each culture the dynamics of the culture are expressed in terms of their cosmology. Their description of how the world started and what is really going on within it is a reflection of the dynamics of their culture. Whether their explanation is of the interaction of the Gods or the mechanics of science, these explanations change as cultures change. It seems to most of us that science is in a different category than other cosmologies because we strictly test all our theories. But the very structure of our minds is what gave rise to the scientific method and re-enforces it. As someone trained in the sciences, I am dedicated to the scientific method and believe strongly in its effectiveness to reveal “truth”. But I also understand that to some degree, culture affects how we perceive the world around us. This is clearly shown in Tai-chi training. It is shown in how students interpret what the teacher says, for example. It is difficult for them to accept the teaching in its most simple form because their minds are not ready to receive the ideas and their bodies have not experienced them. And so they interpret teaching in odd ways. A typical example is that in Tai-chi we use “whole body movement”. This means that every joint and muscle is in continuous movement appropriate for what it is doing at that moment. This results in fluidity. Yet many Tai-chi students (and teachers) interpret this to mean that you keep the body stiff, with no movement whatsoever in the torso but the body as a whole moves slowly and smoothly. This latter understanding is clearly absurd yet it is commonly followed. I was teaching a student to “release your attention out the back as much as you move your attention forward”. He interpreted that to mean that he pay attention to his back (the back of his torso). We can only understand what our minds allow us to understand. As the dynamics of our minds change through time, our relationship to our bodies and to the environment changes. And then our cosmology changes. Just think what the changes to our attention, caused by our addiction to electronic devices will do to our cosmology in the future. Tai-chi students must understand the relationship of the dynamics of their attention to their perception and seek to maintain a dynamic, balanced and alive attention, consistent with what is required by the body to maintain health and joy. When you learn to let go, you find that tremendous energy fills you. How would our modern cosmology be affected if everyone practiced Tai-chi? If every part of our body is experienced as being alive and conscious, then the world around us is experienced the same way. We no longer look at animals as dumb, but filled with consciousness, just of a different nature than ours. The big bang can be seen as the birth of a living organism and its growth as the growth of that organism, including the growth of consciousness. By making ourselves more alive and conscious as individuals, we are participating in this evolution of the living organism, the universe, just as each cell in our bodies participates in the evolution of ourselves as individuals. And just as the death of one cell of our body is not seen as our own death, the death of individual people is not seen as the end of life but as part of the growth of the larger cycle of life. If consciousness is a force that flows through us, then the death of an individual is not the death of consciousness. On the other hand when we block the flow of consciousness within us as when our bodies are deadened with our unhealthy life-styles, this is more like a death.